Baseball's ever-changing landscape shifted again last year with the debut of American League Rookie of the Year Shohei Ohtani. The Angels reaped the benefit of his talents on the mound and at the plate, with the Japanese phenom going 4-2 with a 3.31 ERA, 1.16 WHIP and 63 strikeouts in 51 1/3 innings as a pitcher and batting .285/.361/.564 with 22 homers and 61 RBIs in 104 games as a DH and pinch-hitter. 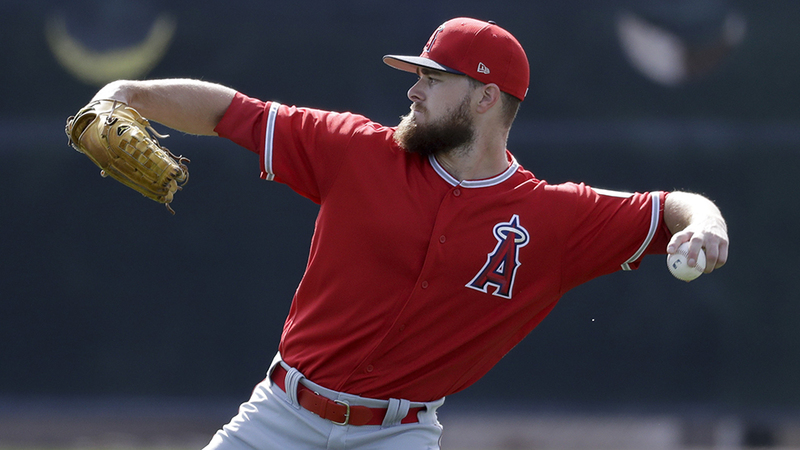 That success has opened a new door for teams across the Majors, and the Angels hope to catch lightning in a bottle a second time with Jared Walsh. A 39th-round pick out of the University of Georgia in 2015, Walsh put up solid numbers during his first three professional seasons before breaking out last year. The 25-year-old parlayed a hot start with Class A Advanced Inland Empire -- he slugged 13 homers in his first 40 games -- into a promotion to Double-A Mobile, then hit his way to Triple-A Salt Lake. All told, Walsh set career highs in nearly every offensive category, batting .277/.359/.536 with 64 extra-base knocks -- including 29 homers -- and 99 RBIs in 128 games. It may have gotten lost in the buzz surrounding his big year, but the lefty-hitting, lefty-throwing Walsh also made eight appearances on the mound. In a small sample size of 5 2/3 innings, he posted a 1.59 ERA and fanned seven of the 25 batters he faced. That surprised neither the club nor Walsh, who doubled as an infielder and pitcher during his college career in the ultra-competitive Southeastern Conference. With the success of Ohtani and the continuing shift toward roster flexibility, the Angels told Walsh last September that they wanted him to also try becoming a relief pitcher. He fully embraced the opportunity to try his hand as a two-way player. "I played in the instructional league during the fall and was focused solely on pitching," he said. "I wanted to work on my mechanics but more importantly to see how my arm would feel and respond. There aren't a lot of 25-year-olds at instructs, but I was excited to be out there. "Generally, every team has one position player who gets thrown out on the mound if games get out of hand. With my pitching experience in college, I've been that guy. I had a few opportunities and [the Angels] liked what they saw, I guess. I was happy for the chance when they approached me about this." Happy, yes, but he also was cognizant that he was trying something he had not done with any regularity since turning pro five seasons ago. The Georgia native understands that becoming a Major League-quality hurler will mean plenty of work with no guarantees, but he also has an eye on the rewards that could come from it. "I've missed out on four years of reps [as a pitcher]," Walsh said. "There's going to be growing pains, and I accept that. I do think having experience pitching as a kid and then in a college will certainly help, but it's also a lot different compared to the Minors, where the game is so much harder. But I'm still ready to jump in headfirst. "I started throwing a bit earlier during the offseason and I changed my workouts, although nothing major. No matter what I'm focusing on, it's important to remember that it's quality over quantity. I'm not going to do much good if I hit two buckets [of baseballs] off a tee after throwing in the 'pen. If I can get 25 good swings in, that's better than 70 average ones." Walsh exudes confidence and positivity when discussing his new role. With the bright lights of the big leagues one step away from where he finished last season, he's open to anything the organization wants him to do that might help him get there. "If you go into something afraid, bad things generally happen," he said. "I have no set expectations at this point. There's really no blueprint for this, particularly since I'll be used as a reliever. But if I'm consistent with my preparation and work, I'll be fine. We have a plan in place, and communication with the staff on how my body feels is a big part of that." With the famous words of Yogi Berra ("Ninety percent of the game is half mental") echoing in his mind, Walsh has yet to fully grasp what differences he'll face in his dual roles. He's well-versed in the preparation -- mental and physical -- it takes to play every day. But how will his approach differ when he's on the mound? "I haven't done it enough consistently to answer that," he admitted. "It's a good question, though. When I think about it, it has a bit of a Little League feel to it, when you really didn't know what you were going to do until you got to the park. Was I going to pitch? Was I playing the outfield or the infield? I'm not going to stress over that stuff, though. I look forward to that challenge." As Walsh enters his third Spring Training as a prof, he's in big league camp for the first time. The Angels gave him a non-roster invitation on Jan. 25. Instead of finding himself throwing with fellow Minor Leaguers on the back fields of the club's facility in Tempe, Arizona, he's rubbing elbows with big leaguers. Some might see that as added pressure, but not Walsh. "I think all players have one thing here or there that worries us out there," he said. "But the key is to not put a ton of pressure on yourself. The game is fun and, although it's my job, I try and keep that in mind when I'm out there. To be able to go out and try and be a pitcher and position player is beyond fun for me. I'm so appreciative of what the Angels are letting me do. I'm out there throwing bullpens with established big leaguers right now, so it's great regardless [of] what happens." In addition to preparing to face pitchers for the first time in months, he's working on thinking like one. "As a hitter on the other side, you don't know what's coming most of the time," he said. "Sometimes the pitcher is in the driver's seat, even though hitters like to believe otherwise. But pitchers often control the tempo of the game, and having that feeling while out on the mound is pretty cool." While another notable Minor Leaguer, second-ranked Rays prospect Brendan McKay -- appears to be limiting his time as an first baseman while continuing to pitch, Walsh sees his own dual-threat status as an on-ramp to the bigs. "As players, if you ask any of us, we're trying to get to the Majors no matter how we do it," he said. "If I had a choice, I'd be an everyday guy up there. I love hitting. But when it comes down to it, I want to do whatever I can to contribute to my team's success. If the Angels see me as a left-handed bat who can help, that's great; if it's as a pitcher or both, like we're trying now, terrific. This is a lifelong goal I'm working towards and as long as I'm helping my club win, that's what I'm going to do." As Walsh embarks on a path filled with question marks, he doesn't lack confidence in himself or in what's to come. Pitchers have impressed at the plate before. But the ability to play the field, hit and pitch as a big leaguer is something reserved for the Ohtanis of the world. For now. "I'm a baseball player, not a two-way player," he said. "I'm going out there as an athlete. No matter what role I'm playing that day, I'm going to rock and roll, give it my all and see where it takes me."